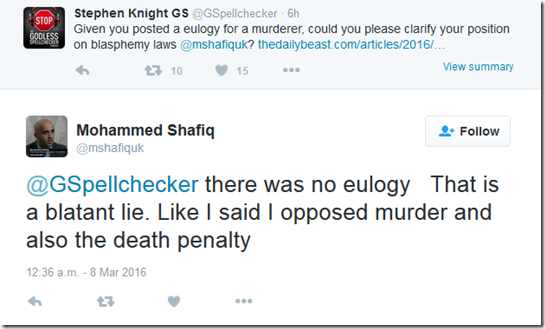 Will Mo Shafiq Please Outline The Correct Application Of ‘Blasphemy’ Law? I recently wrote about the British Imam from Bradford who openly proclaimed his support for Malik Mumtaz Qadri, a man who gunned down a Pakistani governor named Salman Taseer in the service of ‘blasphemy’. Qadri was executed for this crime last week1, sparking outrage amongst many Muslims who consider Qadri be more of a martyr than a murderer. Over at The Daily Beast, anti-extremist Maajid Nawaz laments the support for Qadri amongst his fellow Muslims and highlights a number of examples from so-called ‘moderates’. Amongst those named and shamed is Mohammed Shafiq, the Chief executive of the Ramadhan Foundation and former Liberal Democrat. 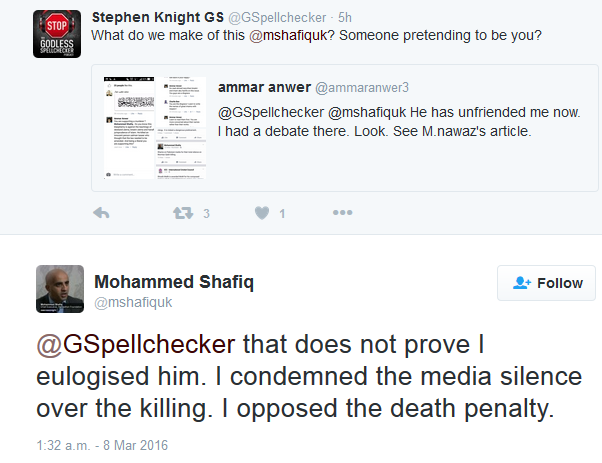 You may recall that Shafiq had previously referred to Maajid Nawaz as ‘Ghustaki Rasool’ (defamer of the prophet) for tweeting out a Jesus and Mo cartoon of Muhammad. Nawaz did this to demonstrate his lack of offence at such drawings and to show his support for freedom of expression. Mohammed Shafiq, who runs the Ramadan Foundation website, a regular pundit on the “community leader” circuit, posted a prayer eulogizing Qadri and criticized Pakistani media for not condemning Qadri’s execution. ‘Salaam’ is a common Arabic greeting, or gesture of respect. ‘RA’ is shorthand for ‘Radhiallahu ‘anhu’ which means ‘may God be pleased with him’. Here is a perfect example of the problem we have with so-called moderates. 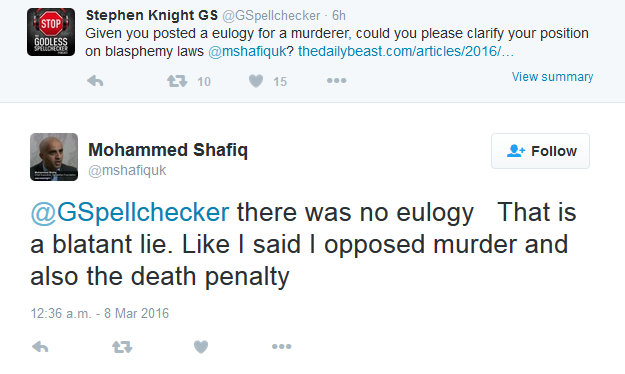 Instead of condemning the implementation of any blasphemy laws, Shafiq engages in weasel talk. 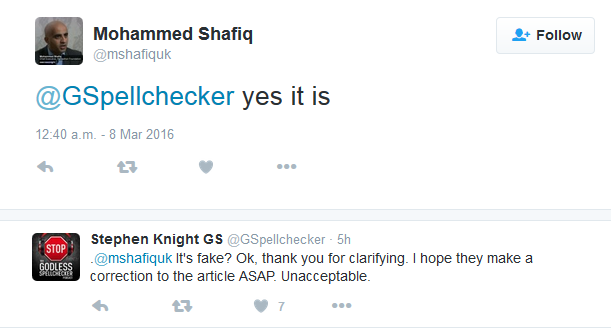 Shafiq has indicated he will be blogging a response to Nawaz’s article. 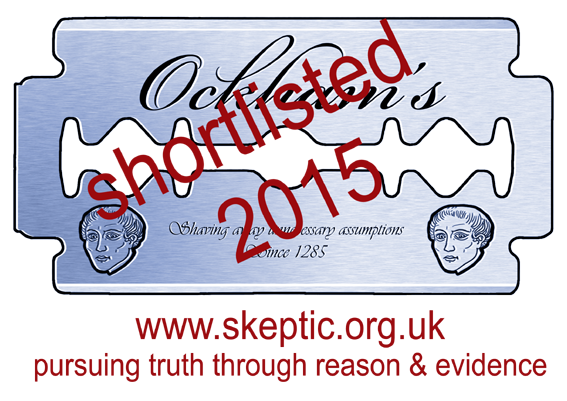 I’d be incredibly keen to see him detail which ‘application’ of blasphemy law he feels is the ‘correct one’. 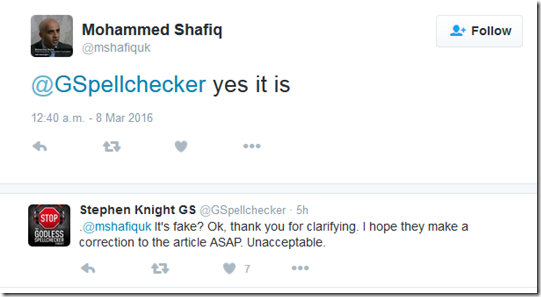 It’s no surprise that Shafiq supports Quadri’s actions. 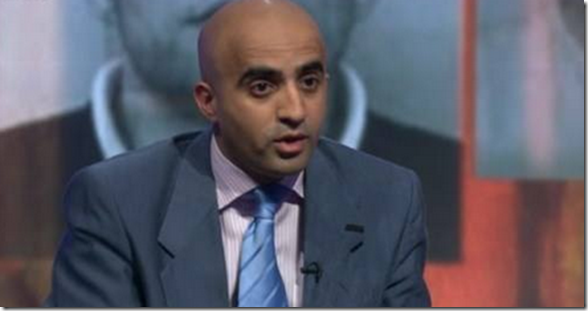 I was surprised to read his article in the paper criticising the muslim community on the grooming issue. Although, the skeptic in me suspects there’s a stealthy islamist motive behind it. It’s become common to discover an islamist agenda when you scratch beneath the surface of these so called moderate muslim community leaders/politicians. The mask usually slips at some point. Will the numbers of the true reformists ever be great enough to confront the non reformists? It’s in the Koran. He can lie to protect, and promote, Islam where he may feel threatened. With Muslims, there is often a scam going on. They CONTRIVED, and God CONTRIVED. God is the supreme CONTRIVER. God said: “Jesus, I am about to claim you back and lift you up to Me. I shall take you away from the unbelievers and exalt your followers above them until the Day of Resurrection. (the day of Judgement, when all souls will be Resurrected) Then to Me you shall all return and I shall judge your disputes. The unbelievers shall be sternly punished in this world and in the world to come: there shall be none to help them. (Qur’an 3:52-56 Dawood translation)Note: Dawood in his introduction pp 5-6 says that he uses the term “God” to refer to the Islamic Allah. He also says that in the Qur’an Jews and Christians are regarded as having been originally given revelations about Islam from their prophets who were actually Islamic prophets, but Jews and Christians corrupted their scriptures into the Torah and bible that is used by those respective faiths, which are not the true faith that they are called to. In the Yusfali and Shakir and Pickthal versions they substitute Contriver for Deceiver. Fascinating chap. Can’t think why he choose to join the Lib Dems if he has dodgy opinions on free speech. The most annoying thing about Islamists are this sort of behaviour… “I oppose the misapplication” yet never defining what’s the “true” interpretation. It seems the only “true” interpretation is the interpretation backed by an empire (i.e. the Ottoman) and therefore something that you cannot criticise that puts Islam in a “bad” (or rather primitive) light. One of the hardy perennials of the whole media debate on Islam. I’d seen him so many times advocating reasonable if specious positions so it was an eye-opener to see him fail miserably when put on the spot on The Big Questions in that Do British Muslims Have A Problem With Apostasy? debate. Plenty of other so-called moderates began having their disguises taken apart around that time and all it took was persistence and scrupulously specific questioning. Sacranie, Bukhari, that fat-faced, oily sod from 5 Pillars, Ansar… The fact that dishonest demagogues like them were chosen to represent reasonable, honest Muslims whenever a TV debate came around did a lot of harm to the Islamic community. I oppose the misapplication of witch-burning. If you’re going to burn someone alive at the stake, you better make sure that the person is definitely a witch. But the only way to find out if someone is a witch is to drown them. If they sink to the bottom, they were human, but died gallantly. If they are a witch, they will float and should then be burned. This is the proper way to prove witchcraft. Trying to extract or decipher when a muslim person is telling the truth can be challenging, Richard Clarke former NSA and security consultant with ABC News calls Pakistanis pathological liars. From my own experience, I was in conversation with a 30 years plus muslim friend of mine, I had said that islam appears hostile to non-believers, he replied “if you read the koran there are no bad passages plus it says killing one person is like killing all of humanity”. Its clear this commandment is intended for the Children of Israel and not to all people. There is also an escape clause, “unless it be for murder or spreading mischief in the land.” If someone is “spreading mischief”, he can still be killed, right? If its still not clear just read the next verse as follows. BTW if you don’t except islam that is considered mischief too. So there you have it, the only way my muslim friend can persuade me that his religion is indeed peaceful is to totally twist and misquote this verse and hope I will buy it. Hi Denash – I wasn’t suggesting your quotes aren’t entirely accurate – only that maybe quite a lot of Muslims aren’t aware of them. But too much of the scriptural literature is problematic. My nephew is currently visiting from Indonesia. Last night he and his friend slept at our house, and we stayed up until 2am drinking various spirits, eating various foods and discussing religion. He’s 26 and comes from quite a tolerant background, but most if not all of his and his friends views were mind boggling. Evolution is just theory, Islam is fact. Man is created from clay. Ghosts are made from fire. Mohamed split the moon and Nasa have confirmed it to be true. Salt water vs rain water. Flying donkeys etc etc. I didn’t hold back on my opinion of Islam like I normally do when I’m in Indonesia, and although I touched on some very heavy subjects, including painting very vibrant verbal picture of how I perceive Muhammad to be, they handled the criticism extremely well, and the conversation didn’t become heated and aggressive like similar discussions I’ve had with Muslim friends/colleagues in Europe. When trying to pass Islam off as tolerant and accepting of everyone, I questioned why I had been forced to convert to Islam to marry his Aunty? My son has quite an extensive fossil collection, so I showed them various bits ranging from 400-15 million years old, but they had no impact. Apparently it’s an indisputable fact that Adam was created by god as a bob standard ready to rumble walking, talking, cooking, building, climbing, jumping, wanking, spanking youman bean. I urged them to visit the Natural History Museum, and ask the staff in the investigation room to explain the theory of evolution, and explain the meaning of “theory” (as my explanation had made no headway). Though, I suspect it would have zero to little impact on their outlook of life, the Universe, and all it’s splendours. Their defence system is so well tuned that alternative ideas go in the left and out the right ear, and I feel they’ll have no problem erasing the evenings conversation from memory, or dismissing it in a way that suits them. I genuinely feel sorry for them, in a compassionate non patronising way. I know that there are things the West has done that are bad and interventionism and past colonialism feed some of the present mess in the Middle East but *most* of it is due to the nature of the religion. This is because Islam requires authoritarian leaders (e.g. Patricia Crone, God’s Rule) and it is sooooo excluding, evangelical, righteous and sectarian by nature. The Sunni Shia thing has been a live issue since the Prophet died with war breaking out a few decades after – and its gone on ever since with proliferation of sub sects within them (particularly in Shiism) and a few small ones outside them. Christianity more or less got over it long ago – Islam remains consumed with it. Even the northern Ireland thing – the antagonist parties were/are pro or anti union with Rep of Ireland and pro or anti English far more than sectarian and Normans ruled Ireland on behalf of King in England from 11C. It intensified with the Protestant monarchs largely because of the threat from Spain . The message that the Islamic world needs from the West is modernise your religion cos your societies are never going to succeed in making a global caliphate. Even military power in the modern world depends on maintaining technological edge. That requires an advanced economy and it requires that the science underlying it can respond to shocks and changes – social, environmental, economic, military – with new developments . This means advanced research and development and that requires a culture that values innovation. Engineers, IT people, doctors practise the discipline but they are not researchers, scientists and people who value innovation or curiosity. The USSR was a secular power but it eventually collapsed because its system was too inefficient and it could not maintain cutting edge other than nuclear. Like the Pope said Catholicism views curiosity is bad. And Islam says don’t do bidah – innovation – its a big big sin. The world has globalised and you can not un globalise it. Its not just the west, its China, Russia, Japan, South Korea, India and to a lesser extent plenty of industrialised countries. With lowish technology, Islamists might be able to damage some other powers, or progress to some form of damaging state, but they will Never be a superpower. Even with a fair number of engineers and doctors (mainly trained in the West) the Islamist societies are headed for being an embarrassing poverty stricken, Neanderthal mess unless they stop pretending the the modern world never happened and start humanising their religion. Stop the insane degree of obsession with purity of patriarchal lineage – designed to produce authoritarian clan groups headed and controlled by males and of necessity welded together by a very authoritarian (and pious) ruler and religion. Stop the obsession with making sharia extend to all aspects of life and making rituals permeate all aspects of life. Stop the treatment of nonbelievers within and without the religion. Stop saying the Qur’an is uncreated and divine emanation of god. Because in reality Islamists can’t become a glorious civilisation – the “best” they can do is drive their people into the Western world where in sufficient numbers the intransigence and sheer resistance to liberal humanism of the Islamic culture forces the majority population to become much more Christian and traditionalist in response. And I would argue that Islam is many degrees more traditionalist that the great majority even of North American Christians. Although all major religions have strong charitable elements the main features are Always around maintaining hierarchical, rigid family obligations designed to support maximum reproduction and child rearing, patriarchy – they originated in an era before technology globally reduced the mortality rate of infants aged from birth tho five – dramatically – and before reliable and ethical means of contraception (the pill) was developed. In short religions appeared before this but persist in their traditionalist form when we have the capacity to match population to environmental constraints, but not lose population unduly. Because without this twentieth century innovation – reproduction (both conception, birth and child rearing) is a heavy burden on women hence patriarchal whether in terms of women being devalued, or because they can’t contribute as much income earning labour or women having to become pregnant and raise many infants because so many die, or because society is more violent when there is scarcity and/or population fluctuates a lot. Meanwhile if we follow the Islamists preferred model, and lots of devout Muslims spread to the West – these societies as a whole becomes polarised into different communities over time, the whole gets much more conservative, thus the western societies get poorer and periodically aggressive externally too. Meanwhile the Muslim countries are a complete backward mess cos they are busy trying to assert sectarian purity and they lack the overwhelming military might to establish the equivalent of an Ottoman empire to weld them together, buffer the ruler from other clans with slave administrators and palace guard and focus dissent on war against non muslims. Meanwhile the non western superpowers are caught up in all the instability and theres probably WW3 and we all go back to crap. – reproduction (both conception, birth and child rearing) is a heavy burden on women hence patriarchal. In conditions of reproductive stress (either under or overpopulated) women are more likely to be devalued because they can’t contribute as much income earning labour especially with high rates of reproduction; because men tend to become dominant if women have to often become pregnant and raise many infants because so many die, or because society is more violent when there is scarcity and/or population fluctuates a lot. Purely agricultural societies also tend to be patriarchal particularly if there is need for heavy manual labour and there is little by way of back up income for bad years.